Turkish Finance Minister Berat Albayrak has announced a cheap lending scheme for SME's: SMEs who are members of the Union of Chambers and Commodity Exchanges in Turkey will have access to a total pool of TRY 20bn, with exporters and manufacturers getting up to TRY 1mn each, and other SME's getting up to half that amount. Such loans are aimed at working capital needs of these companies and will be offered at cheap rates: 6- months grace and 1.45% monthly interest rate, which is significantly lower than the prevailing cost of capital for this sector. Albayrak was unclear whether this funding will impact the budget or not. He alluded to the size being well within the limits of the Credit Guarantee Fund (KGF), which might mean that the loans will carry government guarantees. These details are less important for the FX market. The market mainly cares about the implication for overall monetary conditions and for average interest rate levels in the economy. If the government offers schemes which lower the interest rate for a section of the market compared with the market-driven interest rate which existed in that market segment, then this effectively loosens monetary conditions and would ultimately weaken the exchange rate. In this regard, the new scheme is a small one, only 3.2% of loans to the SME sector, and much smaller as percentage of all loans. Hence, it should not have a noticeable impact in itself; nevertheless, the real question is whether or not this marks the beginning of many policies to achieve lower interest rates in the broader economy as President Erdogan wants. That would be unambiguously negative for the lira. In summary, the real economy is contracting but could stabilise quarter-on-quarter in the next two quarters. 2019 is still likely to record slower than 1% growth. As far as the lira is concerned, USDTRY has declined sharply over the past couple of months, but the risk lies to the upside if the government feels pressure to find stimulus measures to fight the recession. 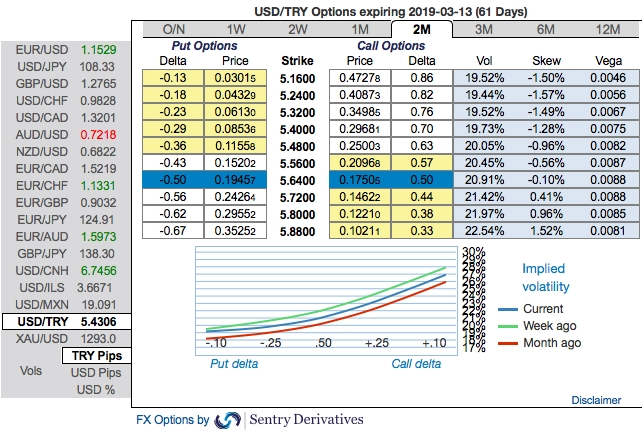 Trade tips: 3m USDTRY debit call spreads are advocated with a view to arrest upside risks. Initiate 3m 5.25/6.77 call spreads at net debit. Thereby, one achieve hedging objective as the deep in the money call option with a very strong delta will move in tandem with the underlying spikes. Please observe that the above technical chart is also clearly indicating the further upside risks. It seems that hedgers of TRY are also in line with the above fundamental factors. As you could observe the above nutshell, IV skews of USDTRY is also indicating the upside risks as the hedgers’ interests for OTM call remain intact. Currency Strength Index: FxWirePro's hourly USD spot index is flashing -51 (which is bearish), at press time 13:24 GMT).